Gary Groth, ed., Sparring With Gil Kane: Debating The History and Aesthetics of Comics (Fantagraphics, 2018). $22.99, pb. Sparring with Gil Kane is a book of conversations, but its title suggests a contest or bout, as if intellectual disputation were a knuckle-bruising donnybrook or prizefight—or perhaps the equivalent of a few rounds among friendly but formidable partners. That sounds about right, because it seems that the late Gil Kane (1926-2000), a voluble critic of comics as well as a great comics artist, became a self-taught intellectual partly for competitive reasons, that is, to avoid being outfaced and humiliated by those he worked for. By his own admission, Kane’s early efforts at serious self-education were spurred by masculine oneupmanship. Sparring is the brainchild of Fantagraphics publisher and longtime Comics Journal editor Gary Groth, who seems to have shared in that sense of argument as competitive sport (oh the debates that Kane, Groth, and the late Burne Hogarth, another fierce and fluent conversationalist, must have had—theirs is a legendary circle of talk). Indeed Sparring comes across as a semi-autobiographical book for Groth, even though he was not involved in all of the conversations captured within it. In the past, Groth has written movingly of his friendship with Kane, and that friendship helped build a larger audience for Kane’s reflections on and criticisms of comics. (Kane’s public rep as a champion thinker began, as Groth notes, with an epochal interview by John Benson in Alter Ego in 1969.) Sparring mostly documents Kane’s later years as a comic book provocateur, one who had experimented with self-publishing and the graphic novel format and grown impatient with the straitened horizons of the industry and its barrel-bottom standards. The book gathers up a dozen interviews and roundtables that Kane took part in between 1969 and 1988 — and whenever Kane took part, his voice came through loud and clear. What we get here is a record of history in the process of being made, through talk. I confess I felt both happy and sad—the very definition of mixed feelings—when I read this book. I felt happy because Sparring records the voices of outsized talents like Kane who railed against the miserable standards of the industry and devoted themselves to the history, aesthetics, and possible futures of comics. Further, the book is well designed and richly, unpredictably, illustrated, with images not only from Kane and his sparring partners but a legion of other artists. There is so much here to take in. Yet I felt sad too, because, one, I’m ambivalent about Kane’s own artistic efforts to improve the comic book (he seemed boxed in by the very standards that he decried); and two, the intellectual and social world captured in this book seems to me to have already faded, or to be fading away rapidly. This book recaptures some of the spirit of the early Comics Journal, a magazine that, like the friendship between Kane and Groth, arose from the feisty formative years of the direct market, specifically from the independent comics movement and the belief that comic books could be something more. That belief still animates the best in comics, but has been decoupled, I think, from the direct market, whose severe limitations we now see all too clearly. In some ways this decoupling is to the good; the world of comics and comics criticism has opened up. But I miss the sense that a bright future for comics could be found in the comic book vernacular, in an independent but genuinely popular print culture conserved by fandom and the direct market (on that note, I think this book pairs well with Dan Gearino’s recent history of the direct market, Comic Shop. Today the most important horizons in comics, both artistically and in terms of entrepreneurial risk-taking, seem to be elsewhere, often online rather than on paper. Sparring with Gil Kane, then, documents a faded time. I must note that women, as participants, are absent from the conversations in the book, a lack that makes Sparring seem already like a historical curio or sad outlier; indeed, the book’s wholly masculine air of intellectual contention underscores an ethos of unquestioning sexism that Howard Chaykin, in his preface, evokes with almost nostalgic wistfulness. The fan and professional culture that the book represents does not appear inclusive or progressive; if anything, Sparring inadvertently shows the limitations of that world. But it would be a shame if this storehouse of lore and anecdote, of opinion and debate, were written off by today’s readers as irrelevant. 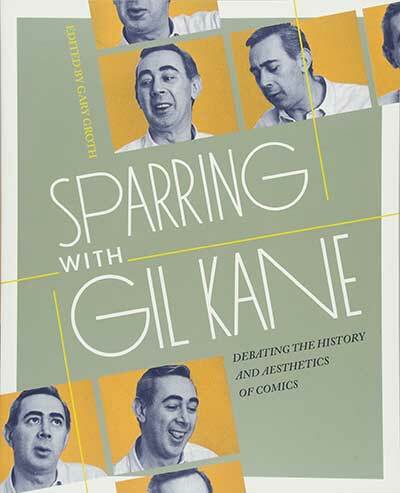 Despite its blind spots and datedness, Sparring is an important volume because it vividly documents an emergent school of criticism founded on a passion for comics—one in which Gil Kane, as gadfly, aesthetician, conversationalist, moderator, and living fund of memory, played an indispensable role. Sparring with Kane is really a matter of learning from him, and this is an essential addition to any library of comics criticism.